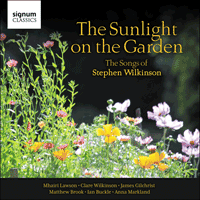 Firmly rooted in the 'English song tradition', the compositions of Stephen Wilkinson bear witness to a lifetime spent in the service of all things singing and draw on texts by a wealth of sources including Auden, Yates, Coleridge, Shakespeare and many more. The sunlight on the garden lies somewhere in the middle of an output of songs spanning most of a rather long lifetime. It evokes World War 2, a real watershed for me, and I have allowed myself a hint of the wail of an air-raid siren and a bomb-drop. MacNeice expresses man’s traditional complaint, but with a captivating deftness all his own, the words seeming to lead him on of themselves almost casually. But suddenly, with a stroke of spine-chilling magic, he makes Shakespeare’s Antony speak to us from ancient Egypt and the here and now becomes the universal. My approach was also to let the words lead me on of themselves, hoping that instinct would come up with something organic. In Proud songsters Hardy is concerned with the same topic, but he says it with little birds. He gives us the busy music of an avian evensong—another day gone of such a short life, eternal though it may seem to the songsters themselves. Happily his last phrase just about gives me time to fuse its four elements and fledge another brand-new songster. East Anglian rectories probably informed two horticultural songs, providing The garden with ‘Fair Quiet’ and ‘a green shade’ for Marvell’s idyll, and in The gate in the wall ‘beds and borders’ no longer accessible but clearly visible to Eleanor Farjeon’s nostalgic eye. Shakespeare gave me three texts. If Come away, death and Crabbed Age seem strangely disparate in style, the one expansive, the other terse and a bit jazzy, please remember that they were written almost fifty years apart. It took the best part of another twenty to evoke Eternal summer. The opening phrase on the piano is very modest, almost as if the poet were thinking aloud, but as the verse rises to its final hubristic claim it becomes an enthusiastic vivat. Anything but eternal, Winter snow takes a single verse from Christina Rossetti for a tiny atmospheric cameo. It began life as a Christmas card. The contrast in the two Rupert Brooke songs is between the imagined fishy Heaven and the remembered heaven of Grantchester. I had my doubts whether so overquoted a line as ‘honey still for tea’ was susceptible to serious setting, but eventually decided to accept it as an expression of the genuine nostalgia Brooke felt as he sat in the hot and noisy Café des Westens in Berlin in 1912. You must judge whether I was wise. I pruned all the parlour games stuff from the poem. Brooke died tragically immature, but left more memorable lines than that one. How about ‘lissome clerical printless toe’ for a start?—or ‘intolerable consanguinity’, the only two-word pentameter I know? Nothing immature about Heaven, an atheistic romp—‘and the worm that never dies’! It is an ironic advance on his excellent Sonnet ‘Failure’ on the same topic, indeed arguably his best poem. I have severely disciplined the accompaniment to ensure maximum clarity to the words. I loved setting it and, as I’m sure you’ll hear, Clare loves singing it. Spring and fall ('To a young child') is a deeply touching little poem, though hardly characteristic of religious Hopkins. ‘The blight that man was born for’ continues to shock. ‘Worlds of wanwood leafmeal lie’ is just as memorable if not as shocking. Do we hear cynghanedd at work? I hope the poem was not presented to Margaret herself. Did he show it to his Father Confessor? No fewer than five songs set poems by Yeats, three of them stemming from his long unhappy love for Maude Gonne. I have made her, now old and grey, not only ‘take down this book’, as bidden, but read aloud and murmur, ‘a little sadly’ (superb irony! ), how love fled—and spent a great passion on the creation of great Irish verse. Politics is a plain lust-song inspired by a young lady who wisely prefers to remain anonymous. And Running to paradise is a ballad in contempt of all things material. In The hour-glass the accompaniment comes into its own, takes the lead, in fact, with a perpetuum mobile. For Ben it is not sand, but dust or cinders running in the glass. The fly bumbles at the lamp and is finally burnt, at which point the singer takes over the perpetuum mobile, which, deprived of final cadence, just peters out. Nothing to add but a formidable exclamation mark: Wham! In Chapels the ‘nation’s hymn writer’ takes time off to berate Welsh deacons for their joyless solemnity and their congregation for lugubrious singing. I thought I could help him to ‘put off black’ by setting his entertaining text to a cheerful tune in the major over a solemn minor key hymn tune in the bass. I think I have succeeded, for he clearly has a little giggle. Joly Jankyn needs no encouragement to lighten the liturgy; his 'merie ton' in celebrating the Christmas Mass makes his eleyson with its misplaced accent (like a hiccup) almost hilarious. The young girl is besotted with him, and on him her hopes of heaven are fixed. A slow upward piano arpeggio, repeated gradually rising in the processional music, tells us that she is carrying his child. By way of greeting as he administers the sacrament to her, he manages a wink and steps on her toe. Finally, in shame and religious fear, she takes over his eleyson and turns it to a curse. Auden handles sacred mysteries with reverence and shows a surprisingly deep and perceptive empathy with Mary rooted in her anxious watch At the manger. Her agonised outcry in response to her role is far more convincingly human than the received version. A privilege to offer music to such a text. There are three songs for children. I have allowed Coleridge a tweet in Birdspeak and Lear a purr in The Owl and the Pussycat, and George MacDonald even a wheesh or two in The Wind and the Moon—we need not concern ourselves with his obvious intention to present the failed coup as a lesson in humility for the young. We take our farewell of you with a Kiss. If you find it surprising, so too did Leigh Hunt way back in the early nineteenth century. It gave him a lift. You too, I hope. My father’s music has been part of my awareness from my earliest days. Despite being very varied (it spans 80 years), it has a particular language which is all his own; a unique voice, yet deeply rooted in the English song tradition of Finzi, Gurney and Quilter. On becoming an adult and a musician myself I understood its quality, and decided that it ought to be known more widely. This, combined with my father’s natural humility, has led me to be the one who champions his work. Dad is a deep and detailed reader of poetry, and each song grows out of a long, intense consideration of the text. In those phases he sits for hours brooding, not even hearing offers of cups of tea. How lucky we are to be associated with these musician colleagues, who lift the songs off the page with such intelligence and wit. For our family this recording has been a very special experience. I commend these excellent songs to you, not only out of love for the composer but out of deep conviction that they deserve your attention, and hope they will find the place they deserve in the repertoire.